Webmaster in Travel on 22 July, 2015. Our travels had brought us to the Mexican state of Jalisco. 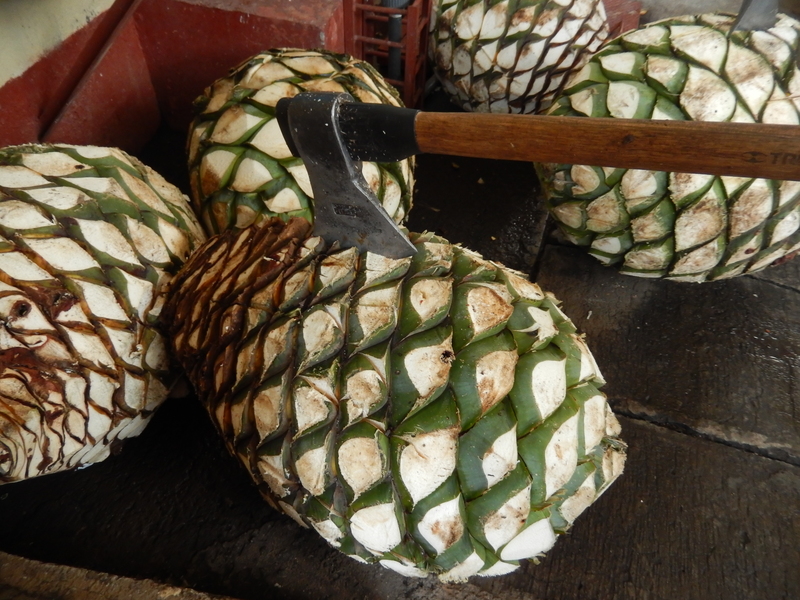 So it seemed that a trip to the ancient pueblo of Tequila —primary source of the agave spirit—was in order. Our transport of choice from the state capital, Guadalajara, was the “Tequila Plus” bus. Unfortunately this was a misnomer — “Tequila Menos” would have been more appropriate. The operator had obviously oversold tickets for the hour-long journey, which meant that the unlucky ones who boarded last (guess who) were expected to stand and have their heads blasted by a micro-blizzard brewed by dysfunctional air-conditioning. When we eventually alighted this freezer on wheels, a sizzling heat jealously embraced us. At this point I wondered: what happens when you mix excessive alcohol consumption with such extreme temperatures? Well, it wasn’t exactly a hypothetical question. Let the experiment begin. Allowing my Mexican friends to do the talking, a street vendor agreed upon a budget price for a historical tour of the town, which of course involved a tequila tasting session. There’s no way we would have paid such a small sum for a comprehensive tour of the distilleries *plus tasting* if I had revealed my foreign status. Ah, the perks of travelling with locals. Being part of a tour group was our key into the distilleries, which compensated for being paraded around the town in a gimmicky tourist bus shaped like a tequila barrel en route. 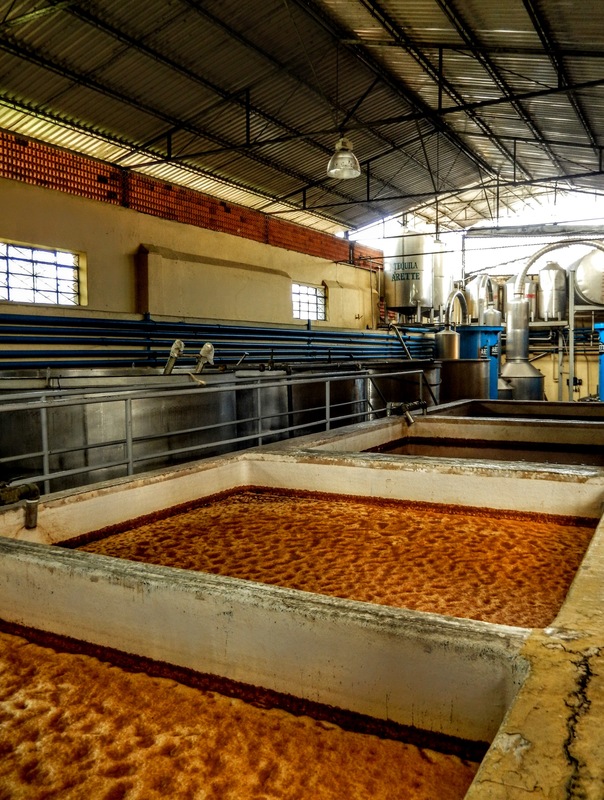 Once inside the first distillery, we were able to observe the whole tequila-making process from agave plant to boiled down syrup, then from fermentation vats to filtration systems, and finally from crystal clear liquid to the woody-coloured, reposado matured in barrels. 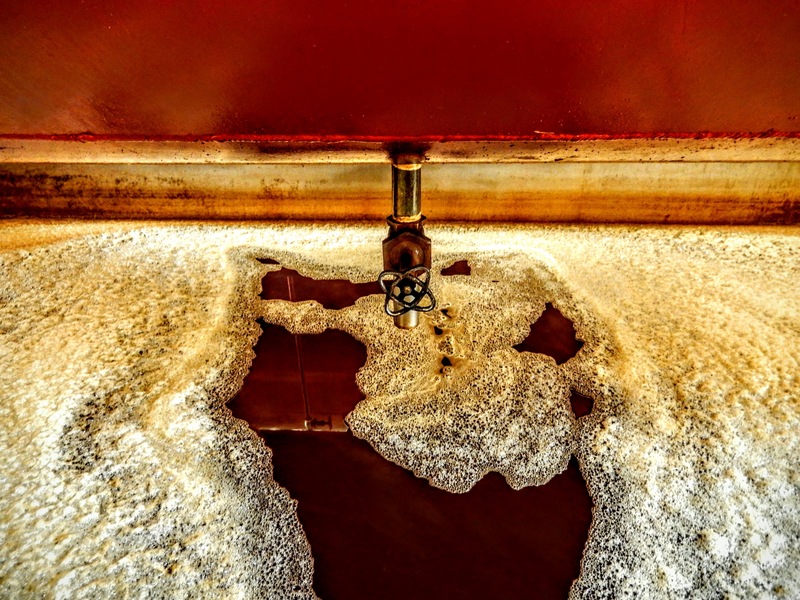 Our jovial guide informed us, while filling our glasses generously, that the matured spirit should be drunk neat whereas the clear liquid bottled straight after distillation is ideal for mixing. One of the most important things I learned (that I can remember) is that it has to be 100% agave. That’s because when “tequilas” have been adulterated with cane sugar they are more likely to bring on hangover symptoms. Uh-oh, I may be returning to the UK a tequila snob. The fermentation process, not particularly appetising! That lazy afternoon we strolled the streets of Tequila under the beating sun in a stupor. The best and worst thing about the town is that every souvenir shop offers free samples of their products, i.e. shots. You just walk in off the street and ask to try all their varieties of the spirit. As the open secret goes, it’s completely possible – and commonplace – to get royally plastered without actually paying for a single drink in the town of Tequila. 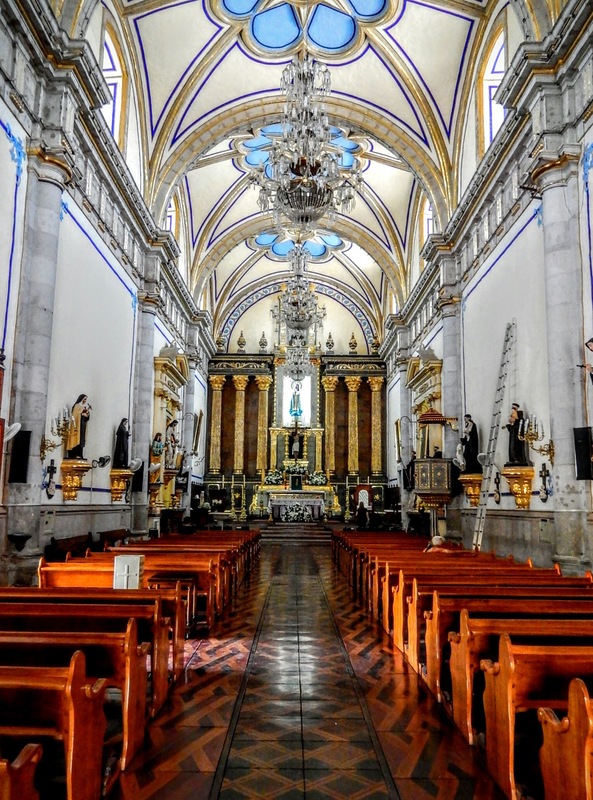 Where you go to repent afterwards, Church of Santiago Apostol, Tequila. “Arriba, abajo, al centro, pa’ dentro” – “up, down, to the centre, inside” (accompany words with gestures, shot glass in hand). After we’d drunk our fill and then some, we began a meandering perambulation in the vague direction of the bus station, making pit-stops at regular intervals to buy snacks. Turns out that Mexico is not a bad place to get the munchies with so much cheap, salty street food at your greedy, soon-to-be-greasy fingertips. Inevitably, we ended up missing our bus. This turned out to be a blessing in disguise, however, because it meant that we were first in line for the next one and were therefore guaranteed seats this time. Remaining upright on the bus was a tricky balancing act even for sober passengers. 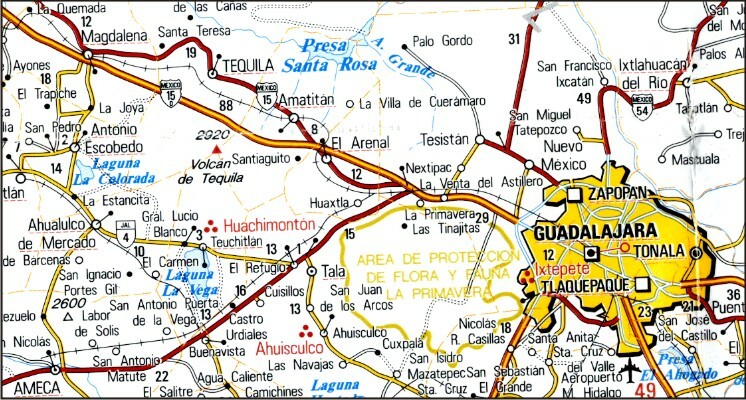 Map of Jalisco with Tequila (top left) and state capital Guadalajara (bottom right). Original version of article published on author’s blog (http://archerabroad.com).